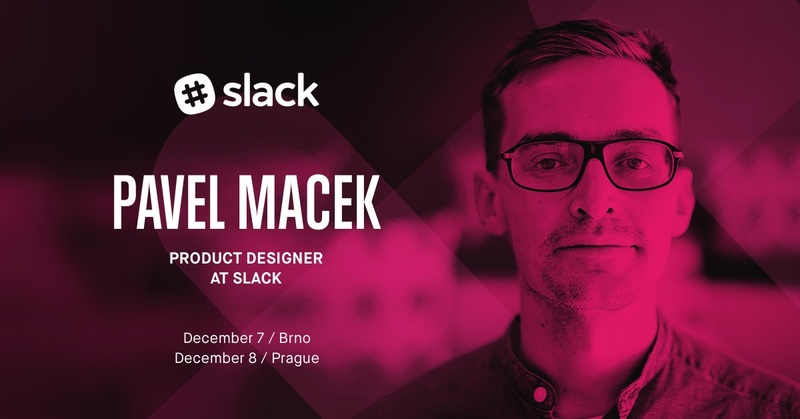 Pavel Macek, a product designer at Slack, will be our last Silicon Valley Insights speaker of 2016. Pavel will be sitting down with STRV COO Lubo Smid to talk about what’s new at the software behemoth as well as how he ended up landing a plum spot at one of Silicon Valley’s most successful startups just a few years after graduating from Masaryk University in Brno. The fireside chat will be held December 7 at Impact Hub Brno and then again on December 8 at our Prague offices. Reserve you ticket today! Can’t wait? No worries, we’ve pulled together some sweet talking points that Pavel will no doubt expand on once he’s in town. Enjoy! Can you tell us about your journey to Silicon Valley — and any advice for those who wish to follow in your footsteps? My journey to San Francisco definitely wasn’t linear, and it took some time. I started thinking about moving abroad in 2011. I didn’t know where to exactly back then. I had a wonderful internship in the UK during my studies, and that got me motivated and curious. A major step for me was working with GoodData and having a chance to visit San Francisco a couple of times, experience the city, make some friends. After that I was facing a decision to either join one of the big tech companies or a small startup. I chose a tiny startup, Screenhero, back in 2013, because I fit really well with the team, and it turned out to be the right decision. They helped me tremendously through my transition to San Francisco, and I still work them today at Slack. My advice would be to have patience. Don’t get discouraged, because you’re not sure where exactly you are heading. You don’t have to be a social media rockstar. All that matters is that you care about your work and keep at it. You’ve been at Slack for nearly two years. What exciting projects have you gotten a chance to work on? I’m a designer on a product team internally called “Calls,” dealing with real-time communication, so my main project has been voice calling across desktop and mobile platforms. Now it’s video calling, and we're just getting into screen sharing. These are hard problems to solve, and I was very lucky to be part of it every step of the way, from initial product definition to final execution. It was recently announced that Slack would be incorporating the AI software IBM Watson Smarts. Can you give us any teeny-tiny insights into what we can expect from this new addition when it’s made available next year? I don’t want to spoil the surprise, but what I know is that the plans are big. Slack holds a lot of your team’s collective knowledge and using AI like Watson can help us make it more accessible for you and your teammates. We’ve announced a developer toolkit, that includes Watson technologies and can be integrated easily into Slack. I think that IBM is also planning to build a chatbot, which will help IT departments. Speaking of chatbots, Slack’s own Slackbot should get smarter thanks to the Watson Conversation system. How does the San Francisco Bay Area tech scene differ from the Czech Republic’s? I think the main difference is by no surprise the sheer volume and concentration of tech companies here. The number of opportunities for someone in tech in the Bay Area is therefore much higher than back home, which helps with the growth of talent. The talent creates startups and companies that attract more talent and so on. What, in your opinion, is the best part about living and working in SF? I would say the best part is the combination of plenty of interesting work opportunities, wonderful nature in the immediate vicinity to the city and the abundance of interesting culture and good food. Although the thing that I appreciate the most about working in SF is that I work among tremendously skilled people with diverse backgrounds and opinions. I find that very motivating and inspiring. For me the toughest is probably the stark contrast between the hip world of startups with $5 lattes and people sleeping in tents on the street or struggling to get by even though they work as hard as anyone. But let’s end this on a high note: I’m really excited to share my experience here and maybe even inspire someone to give the Bay Area a try.